A 56-year-old American has become the first woman on record to swim across the Atlantic Ocean. Jennifer Figge of Aspen, Colo., touched land last week for the first time in almost a month. Reaching a beach in Trinidad — exhilarated and exhausted — she realized a dream she’d held since the early 1960s, when a stormy trans-Atlantic flight got her thinking she could don a life vest and swim the rest of the way if needed. Figge left the Cape Verde Islands off Africa’s western coast on Jan. 12, swimming about 2,100 miles through strong winds and waves of up to 30 feet. She said Saturday that she now planned to swim from Trinidad to the British Virgin Islands, ending her odyssey in late February. Then it’s home to Aspen — where she trained for months in an outdoor pool amid snowy blizzards — to reunite with her Alaskan Malamute, Hank. The dog swirled in her thoughts, as did family and friends, as Figge stroked through the chilly Atlantic waters escorted by a sailboat. She saw pilot whales, turtles, dolphins, Portuguese man-of-war — but no sharks. Her journey comes a decade after French swimmer Benoit Lecomte made the first known solo trans-Atlantic swim, covering nearly 4,000 miles from Massachusetts to France in 73 days. No woman on record has made that crossing. Figge woke most days around 7 a.m., eating pasta and baked potatoes while she and the crew assessed the weather. 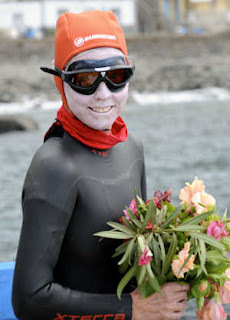 Her longest stint in the water was about eight hours, and her shortest was 21 minutes. Crew members gave her bottles of energy drinks as she swam. At night she ate meat, fish and peanut butter, replenishing the estimated 8,000 calories she burned a day. Figge arrived on Trinidad’s Chacachacare Island, an abandoned leper colony, on Thursday. She plans to leave Trinidad on Monday night.